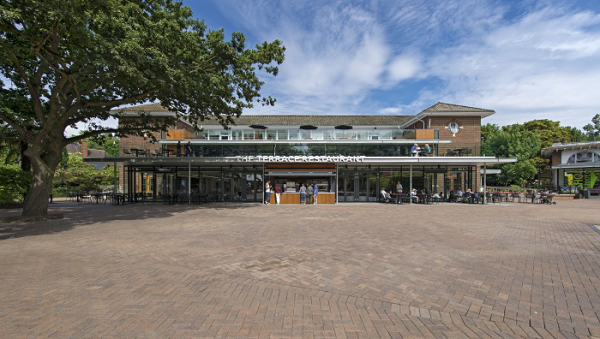 A £4.6m, three-year architecture and interiors project to remodel ZSL London Zoo’s main visitor hospitality space – The Terrace Restaurant - in order to cope with hugely-increased visitor numbers and the need for more back-of-house space, as well as ensuring the space could function as a venue for special events. 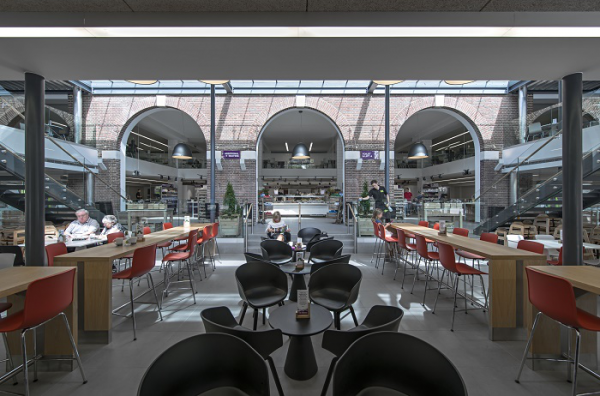 The restaurant’s capacity has nearly tripled as a result, from 240 to 700 covers (making it one of the UK’s largest day-visitor restaurants), whilst the building’s footprint has also increased by almost 1,000 sq m, to include two expansive terraces and a hugely-increased mezzanine floor area. 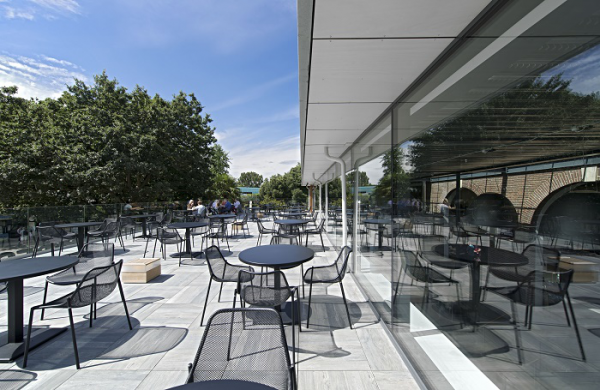 As visitor demands had increased at the London attraction, the existing restaurant needed both more capacity and more food storage space, as well as modernised equipment. 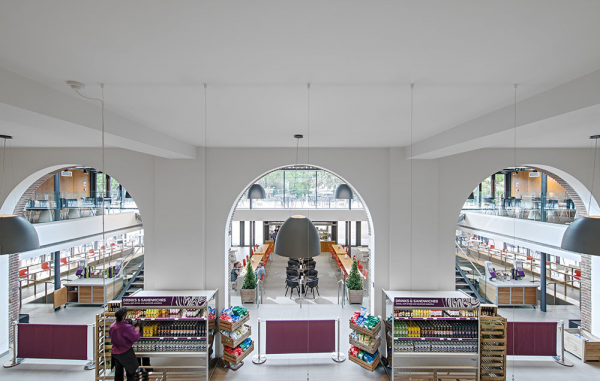 A new design had to achieve these fundamental points, as well as ensuring that that the architectural quality of the original 1915 building (by architect John James Joass) was maintained. Above all, the brief was to create a highly-functional, spacious, robust and high impact space, which would work exceptionally well operationally, add real quality to the visitor experience and be able to cope with the huge volume of people coming through the zoo (up to 10,000 per day). When SHH were appointed to the project, they began by assessing the original building, made up of ground, mezzanine and first floor spaces. Whilst a 1960s, single storey, timber frame extension at the front (extending just beyond the wings of the original red-brick building) had once allowed for increased visitor numbers, it was no longer adequate to cope with the current levels of demand and had be demolished, allowing for the creation of a spectacular new double-height glazed extension, which also revealed the original building’s most significant feature – a series of double-height arched windows, covered over in the course of the 1960s extension work – once again. 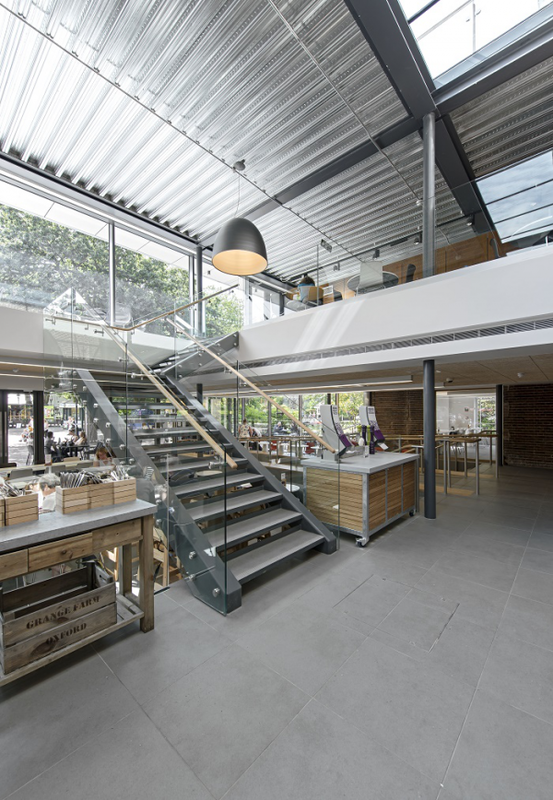 The newly-remodelled building is clean, raw and urban in glass, timber, exposed brick and steelwork columns, with a striking ribbed deck ceiling in the double-height extension. 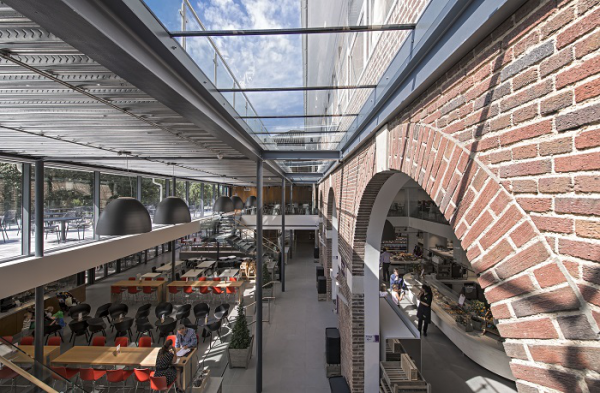 In every direction, visual interest is piqued by different building levels, with drama added by the exposed brickwork arches, exposed steelwork columns, huge-scale Artemide light fittings and the huge-35 sq m rooflight, which extends across the whole width of the extension, directly in front of the brick arched original frontage and the stunning ribbed metal-deck ceiling in the extension area. •	Making the most of the original arched windows, previously covered by the 1960s extension ceiling. 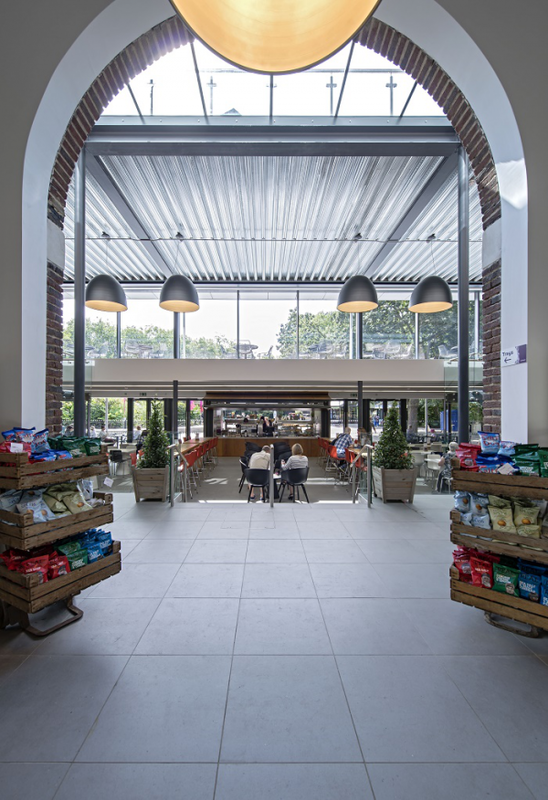 •	Maximising light but controlling temperature and adding integrated kiosks, new balconies, disabled access, expanded mezzanine and smaller hireable spaces. 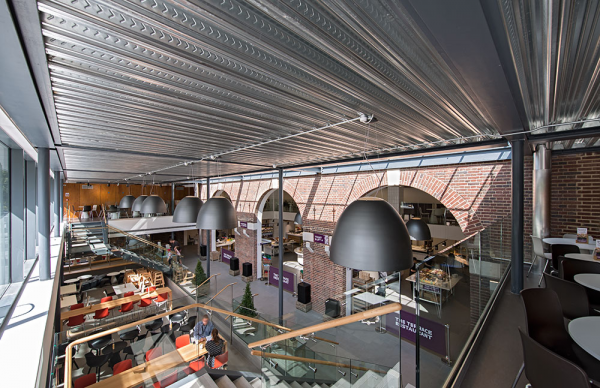 •	Controlling the acoustics in the voluminous space through the use of Troldtekt fibrous timber ceiling tiles, particularly effective for sound absorption, for the ceiling areas beneath the mezzanine floor. The new building will give a 7% CO? emission reduction against existing levels (even when considering the significant uplift in floor area and seating capacity). The reduction of net annual energy is predicted to be reduced in the region of 40%. 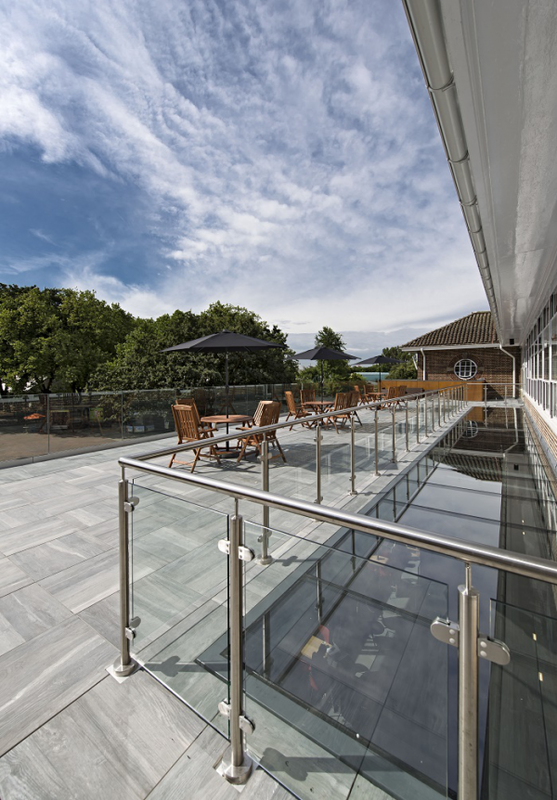 The thermal performance for new build elements were designed to a very high level, above the standard u-values set out by building regulations. All thermal insulation products were assigned a 2008 Green Guide Rating of A+ by BRE and raw material supply chains were also considered in this rating. Solar gains are reduced by encompassing large overhanging slabs/roofs and high performance double glazed curtain walling with low emissivity and argon gas filled cavities. 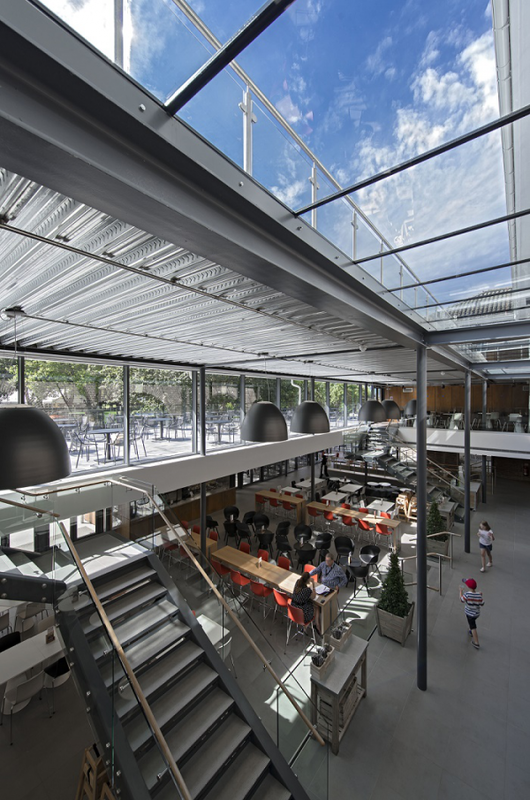 Large amounts of natural daylight are provided through the extensive areas of high performance glazed curtain walling and the large rooflight. The main space heating system is powered by a VRF condenser system with heat recovery (air source heat pumps of this high efficiency are considered a renewable energy source under EU Regulations). A central heat control system has been installed, to control heat/energy flow centrally to each unit. The system additionally benefits from heat recovery within the system, zoned/unit control and simultaneous unit heating.